We present a novel interpolation algorithm for effectively propositional logic (epr), a decidable fragment of first-order logic that enjoys a small-model property. epr is a powerful fragment of quantified formulas that has been used to model and verify a range of programs, including heap-manipulating programs and distributed protocols. Our interpolation technique samples finite models from two sides of the interpolation problem and generalizes them to learn a quantified interpolant. Our results demonstrate our technique’s ability to compute universally-quantified, existentially-quantified, as well as alternation-free interpolants and inductive invariants, thus improving the state of the art. We would like to thank Shachar Itzhaky for giving us access to his PDR implementation. We would like to thank Thomas Reps and the programming languages group at UW–Madison for their insightful comments. 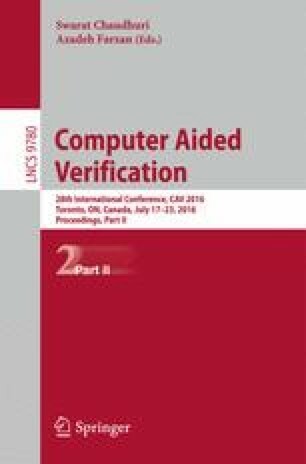 We would like thank Paris Koutris for pointing out the connection between our proof of relative completeness and Pebble-like games. Finally, we would like to thank our shepherd, Mooly Sagiv, who gave us in-depth comments that helped fix earlier inconsistencies in our arguments.